Connolly Design: This is a recommendation? Netflix is a service with which I have a love/hate relationship. Even with the comparatively slim pickings offered by the service in Canada, the monthly fee provides pretty good value. And, of course, the offerings became more compelling since they got into creating their own content, some of which is terrific. And being able to watch on multiple devices is a terrific feature, especially with playback synced across them. I’ve never, though, enjoyed the experience of finding videos to watch. Scrolling through titles can be slow and imprecise. There’s no way for me to easily recall the videos that I want to watch; the “My List” feature reorders videos, making it hard to find something that I thought I had added. 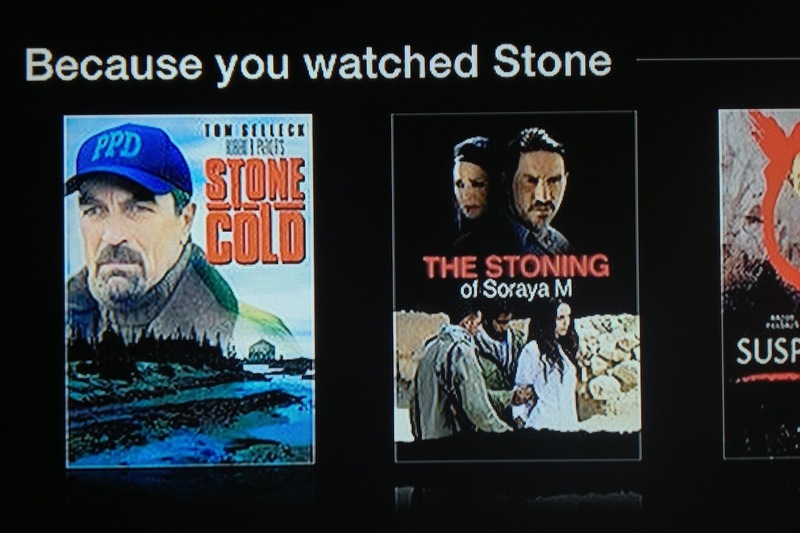 The “Suggestions for You” that it makes can sometimes seem cryptic — what, exactly makes for “Exciting Movies”? And I regularly find unhelpful recommendations along the lines of “Because you watched [title of video]” where the first listing is something else that I watched recently. Here’s a different unhelpful pair of recommendations that I ran into some time ago. Having watched a Robert De Niro movie called Stone (part of it, anyway), Netflix thought that I’d be interested in a movie called Stone Cold, as well as The Stoning of Soraya M. As far as I can tell, the movies have little in common other than similarities in their titles. I get that this isn’t necessarily easy, and my response is mostly bemusement as the recommendations generally don’t add a lot of value for me. It just feels like discovery of what to watch is an untapped opportunity.